Early recorded music was all about gears and humidity,” Chicago Cultural Historian Tim Samuelson declared, opening his talk on the “Mecca Flat Blues” exhibit at the Chicago Cultural Center last week. A small audience gathered in front of the stage where Samuelson, the curator of the exhibit, stood with a century-old Victrola and a player piano. He was there, he explained, to explain the connections between Bronzeville’s since-demolished Mecca Flats building and the music scene that existed around it and, occasionally, under its roof. The Mecca Flats building was constructed at the corner of 34th and State Streets for the 1893 World’s Columbian Exposition. Designed as a hotel for wealthy fairgoers, the Flats featured ornate ironwork, a central courtyard, and a large sky-lit atrium. Real-estate speculators were soon disappointed, though; even the Flats’ luxurious features could not persuade visitors to leave the Fair’s main action on the Midway. In an effort to salvage the project, the Mecca Flats were opened as apartments in 1893. 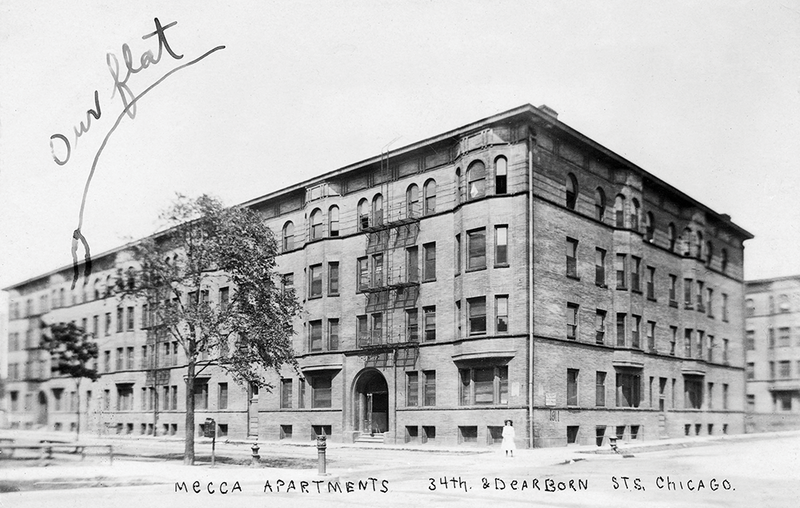 Mecca Flats came to be a central hub of the Stroll, the stretch of African-American businesses that centered on Bronzeville’s South State Street. Samuelson explained, “Club doors to the street stayed open, so you could decide where you wanted to hear your music.” Often, wanderers on the Stroll would also spill into the Flats’ large open atriums. The enlargements lend a sinister air to the exhibit. The photos were taken for articles in Life and Harper’s magazines shortly before the building was condemned and demolished in 1952. The exhibit’s wall text explains that editors rejected optimistic portraits of the building’s community networks in favor of images that supported the building’s reputation as a den of danger and crime. Though the exhibit does not explicitly say so, the neglect and sensationalized decline of Mecca Flats seems to have foreshadowed the fate of Chicago’s public housing high-rises several decades later. Samuelson played records and player-piano rolls from his personal collection to demonstrate the antiquated musical technology of the day. One object in his collection was a piano roll of one of Mecca Flats’ first African American residents, Joe Jordan’s 1909 hit “That Teasin’ Rag.” Though the chair in front of the player piano remained empty, its keys were pressed down as if by ghosts, and, for a moment, the melody of Mecca Flats was brought back to life. Chicago Cultural Center, 78 E. Washington St. Through May 25. Monday-Thursday, 10am-7pm; Friday-Sunday, 10am-6pm. Free. (312)744-6630.